From the very beginning of the project we were saying that we are in Kazan to work. When the project participants were asking whether we had a chance to walk around Kazan, either me or Nolan would probably say that we still have a lot of time to do that. We thought (and rightly so) that our primarily goal is to work on the project. Today at the beginning of day seven we know that there’s not that much time left for sightseeing. We did some of course, however, our only day-off we decided to spend with our project participants. And that has been a great choice! During the last week our friendship grew slowly. By the time we went out together in the end of day six we were not project trainers and project participants anymore; with no effort whatsoever we became good friends. We were there to help with applications, resumes and interviews. Yet, that wasn’t the only point of RecrearApply workshops. All of our participants are smart and well-educated people. They might not know what grad school applications’ requirements are, say, in North America, but they are qualified enough to get into any school. In fact, I believe they are qualified enough to get into the best schools. What was possibly missing wasn’t knowledge or skills, but rather confidence. They do not need teachers or peers, and it’s not what Recrear is about anyways. I guess for the first time in my life I started understanding the word ‘empowerment’, which used to be so foreign and clichéd for me. I was truly witnessing the growth in confidence and, yes, power both within our project participants and myself. Yesterday we had a really great time all together (although for Nolan it has probably been a weird way of celebrating Christmas). We were talking about different things: applying to schools of course, but again and again participants would ask about RecrearMagnify conference and their own ideas for projects. They have been inspired to do something outside two-week workshops, and that has been also inspiring for me. I have been living with these great people in the same city for so long and didn’t even know that they’ve existed. 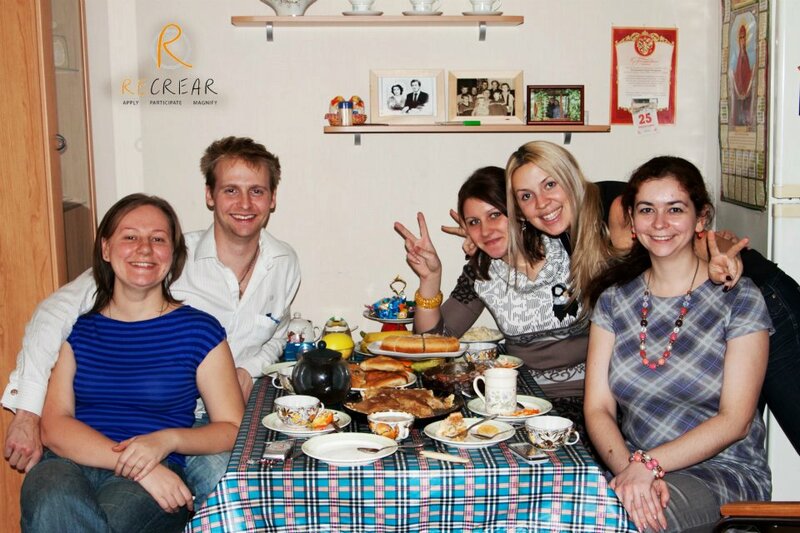 I had to fly over the ocean to find like-minded friends at Recrear to be able to come back to Kazan and find a Recrear family here. I just wish to say thank you to all my RecrearApply friends. It has been a great weekend and I am looking forward to see you tonight! Posted in RecrearApply, RussiaBookmark the permalink. Sasha! what a great words! I am gonna crying… thank youuuuuuuuu! you are right! we are friends and I grateful to the life that it brought me a chance to meet such people as you and Nolan! Keep in touch!! !